High crystallinity GeSn substitutional alloy thin films with up to 8.7 at.% Sn are directly grown on amorphous SiO2 layers at low crystallization temperatures of 370~470 °C for potential applications in 3D electronic-photonic integration on Si as well as inexpensive virtual substrates for tandem solar cells. The optimal Ge0.913Sn0.087 thin film demonstrates a strong (111) texture and an average gain size of 10 μm, and its grain boundaries are mostly twin and low-angle boundaries with low densities of defect recombination centers. The 8.7 at.% Sn incorporated substitutionally into the Ge lattice far exceeds the ~1 at.% equilibrium solubility limit. Correspondingly, the direct band gap is significantly red-shifted from 0.8 eV for pure Ge to ~0.5 eV for crystalline Ge0.913Sn0.087, right at the verge of the indirect-to-direct gap transition that occurs at 8-10 at.% Sn alloying. Optoelectronic properties are greatly enhanced due to this transition. R. Kirchain and L. C. Kimerling, “A roadmap for nanophotonics,” Nat. Photonics 1(6), 303–305 (2007). R. A. Soref, “The past, present, and future of silicon photonics,” IEEE Sel. Top. Quantum. Electron. 12(6), 1678–1687 (2006). J. F. Liu, M. Beals, A. Pomerene, S. Bernardis, R. Sun, J. Cheng, L. C. Kimerling, and J. Michel, “Waveguide-integrated, ultra-low energy GeSi electro-absorption modulators,” Nat. Photonics 2(7), 433–437 (2008). D. H. Ahn, C. Y. Hong, J. F. Liu, W. Giziewicz, M. Beals, L. C. Kimerling, J. Michel, J. Chen, and F. X. Kärtner, “High performance, waveguide integrated Ge photodetectors,” Opt. Express 15(7), 3916–3921 (2007). M. Beals, J. Michel, J. F. Liu, D. H. Ahn, D. Sparacin, R. Sun, C. Y. Hong, L. C. Kimerling, A. Pomerene, D. Carathers, J. Beattie, A. Kopa, and A. Apsel, “Process flow innovations for photonic device integration in CMOS,” Proc. SPIE 6898, 689804 (2008). J. F. Liu, X. C. Sun, R. Camacho-Aguilera, L. C. Kimerling, and J. Michel, “Ge-on-Si laser operating at room temperature,” Opt. Lett. 35(5), 679–681 (2010). J. M. Fedeli, M. Migette, L. Di Cioccio, L. El Melhaoui, R. Orobtchouk, C. Seassal, P. Rojoromeo, F. Mandorlo, D. Marris Morini, and L. Vivien, “Incorporation of a photonic layer at the metallization levels of a CMOS circuit,” in Proceedings of IEEE International Conference on Group IV Photonics (Institute of Electrical and Electronics Engineers, 2006), pp. 200–202. P. Koonath and B. Jalali, “Multilayer 3-D photonics in silicon,” Opt. Express 15(20), 12686–12691 (2007). B. Guha, B. B. C. Kyotoku, and M. Lipson, “CMOS-compatible athermal silicon microring resonators,” Opt. Express 18(4), 3487–3493 (2010). K. Wada, “Challenges of Si Photonics for on-chip Integration,” in Proceedings of European Conference of Optical Communication (ECOC), (Vienna, Austria, September, 2009), paper 2.7.3. F. Dimroth and S. Kurtz, “High-efficiency multijunction solar cells,” MRS Bull. 32(03), 230–235 (2007). H. Kanno, K. Atsushi, T. Sadoh, and M. Miyao, “Ge-enhanced MILC velocity in a-Ge/a-Si/SiO2layered structure,” Mater. Sci. Semicond. Process. 8(1-3), 83–88 (2005). C. H. Yu, P. H. Yeh, S. L. Cheng, L. J. Chen, and L. W. Cheng, “Metal-induced crystallization of amorphous Si1-xGex by rapid thermal annealing,” Thin Solid Films 469–470, 356–360 (2004). C. M. Yang and H. A. Atwater, “Selective solid phase crystallization for control of grain size and location in Ge thin films on silicon dioxide,” Appl. Phys. Lett. 68(24), 3392–3394 (1996). K. McComber, X. Duan, J. F. Liu, J. Michel, and L. C. Kimerling, “Single-crystal germanium growth on amorphous silicon,” Adv. Funct. Mater. 22(5), 1048–1057 (2012). S. Gupta, B. Vincent, B. Yang, D. Lin, F. Gencarelli, J.-Y. J. Lin, R. Chen, O. Richard, H. Bender, B. Magyari-Köpe, M. Caymax, J. Dekoster, Y. Nishi, and K. C. Saraswat, “Towards high mobility GeSn channel nMOSFETs: Improved surface passivation using novel ozone oxidation method,” in Proceedings of IEEE Electronic Device Meeting (Institute of Electrical and Electronics Engineers, San Francisco, 2012), pp. 16.2.1–16.2.4. J. Werner, M. Oehme, M. Schmid, M. Kaschel, A. Schirmer, E. Kasper, and J. Schulze, “Germanium-tin p-i-n photodetectors integrated on silicon grown by molecular beam epitaxy,” Appl. Phys. Lett. 98(6), 061108 (2011). R. Roucka, J. Mathews, R. T. Beeler, J. Tolle, J. Kouvetakis, and J. Menéndez, “Direct gap electroluminescence from Si/Ge1-ySny p-i-n heterostructure diodes,” Appl. Phys. Lett. 98(6), 061109 (2011). B. Predel, “Ge-Sn binary phase diagram,” in Landolt-Börnstein Database: Group IV Physical Chemistry, Numerical Data and Functional Relationship in Science and Technology. O. Madelung ed. New Series IV/5, vol. 5f (Springer, 2013). 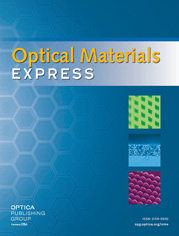 http://www.springermaterials.com/docs/info/10501684_1506.html . V. R. D’Costa, C. S. Cook, A. G. Birdwell, C. L. Littler, M. Canonico, S. Zollner, J. Kouvetakis, and J. Menéndez, “Optical critical points of thin-film Ge1-ySny alloys: a comparative Ge1-ySny/Ge1-xSix study,” Phys. Rev. B 73(12), 125207 (2006). R. Chen, H. Lin, Y. Huo, C. Hitzman, T. I. Kamins, and J. S. Harris, “Increased photoluminescence of strain-reduced, high-Sn composition Ge1−xSnx alloys grown by molecular beam epitaxy,” Appl. Phys. Lett. 99(18), 181125 (2011). W. Guter, J. Schöne, S. P. Philipps, M. Steiner, G. Siefer, A. Wekkeli, E. Welser, E. Oliva, A. W. Bett, and F. Dimroth, “Current-matched triple-junction solar cell reaching 41.1% conversion efficiency under concentrated sunlight,” Appl. Phys. Lett. 94(22), 223504 (2009). G. He and H. A. Atwater, “Interband transitions in SnxGe1-x alloys,” Phys. Rev. Lett. 79(10), 1937–1940 (1997). H. Pérez Ladrón de Guevara, A. G. Rodríguez, H. Navarro-Contreras, and M. A. Vidal, “Ge1-xSnx alloys pseudomorphically grown on Ge(001),” Appl. Phys. Lett. 83(24), 4942–4944 (2003). M. G. Mauk, Liquid Phase Epitaxy of Electronic, Optical, and Optoelectronic Materials (Wiley, 2007), Chap. 5. A. S. Saidov, A. Sh. Razzakov, and É. A. Koshchanov, “Liquid phase epitaxy of Ge1-xSnx thin fims,” Tech. Phys. Lett. 27(8), 698–700 (2001). R. A. Soref and L. Friedman, “Direct gap Ge/GeSn/Si and GeSn/Ge/Si heterostructures,” Superlattices Microstruct. 14(2-3), 189–193 (1993). R. A. Soref, J. Kouvetakis, J. Tolle, J. Menendez, and V. D’Costa, “Advances in SiGeSn technology,” J. Mater. Res. 22(12), 3281–3291 (2007). R. J. Jaccodine, “Surface Energy of Germanium and Silicon,” J. Electrochem. Soc. 110(6), 524–527 (1963). R. Roucka, Y.-Y. Fang, J. Kouvetakis, A. V. G. Chizmeshya, and J. Menéndez, “Thermal expansivity of Ge1-ySny alloys,” Phys. Rev. B 81(24), 245214 (2010). P. Water, Stress Analysis and Mechanical Characterization of Thin Films for Microelectronics and MEMS Applications (ProQuest, 2008), Chap. 3, pp. 78–95. V. R. D’Costa, J. Tolle, R. Roucka, J. Kouvetakis, and J. Menendez, “Raman scattering in Ge1-ySny alloys,” Solid State Commun. 144(5-6), 240–244 (2007). C. G. Van de Walle, “Band lineups and deformation potentials in the model-solid theory,” Phys. Rev. B Condens. Matter 39(3), 1871–1883 (1989). J. F. Shackelford, Introduction to Materials Science for Engineers, 5th Ed. (Prentice-Hall, 2000), Chap. 4. W. Choi, A. T. Findikoglu, M. J. Romero, and M. Al-Jassim, “Effect of grain alignment on lateral carrier transport in aligned-crystalline silicon films on polycrystalline substrates,” J. Mater. Res. 22(04), 821–825 (2007). A. Frova and P. Handler, “Franz-Keldysh effect in the space-charge region of a germanium p-n junction,” Phys. Rev. 137(6A), A1857–A1862 (1965). J. F. Liu, X. Sun, L. C. Kimerling, and J. Michel, “Direct-gap optical gain of Ge on Si at room temperature,” Opt. Lett. 34(11), 1738–1740 (2009). Pérez Ladrón de Guevara, H.
Fig. 1 (a) Ge-Sn equilibrium phase diagram. (b) A zoomed-in diagram on the Ge-rich side . Fig. 2 (a) θ-2θ XRD data of the GeSn sample with 9.5 at.% Sn annealed at 464°C in comparison to a reference pure Ge sample annealed at 660 °C, both for 30 minutes. Note that the vertical axis is in log scale. The inset shows a schematic cross-section of the GeSn sample. (b) Raman spectra of the unannealed and annealed 9.5 at.% Sn sample in comparison to a single crystal Ge reference sample. (c) Crystallization temperature and XRD peak intensity ratio of the strongest peak (111) to the second strongest peak (either (220) or (311)) as a function of the Sn atomic concentration in as-deposited a-GeSn films. The linear fit shows that the crystallization temperature decreases by ~20 °C with 1 at.% increase in the Sn composition. The strongest (111) textured is achieved at 9.5 at.% Sn. Fig. 3 (a) SEM image of the GeSn sample with 9.5 at.% Sn after annealing at 464°C for 30 minutes. The bright dots and lines are identified to be Sn segregates by EDS. (b) SEM image of the annealed 9.5 at.% Sn sample after etching away Sn segregates on the surface, leaving behind the highly textured Ge0.913Sn0.087 thin film. (c) EBSD mapping of exactly the same region as shown in (b), where different colors indicate different in-plane crystallographic orientations. Grains that are ~5 μm wide and tens of microns long are observed. The average grain size is ~10 μm (d) EBSD mapping of the GeSn sample with 14.5 at.% Sn after annealing at 410 °C and etching away the Sn precipitates. While there are more small grains present, the average grain size is still ~5 μm. Fig. 4 (a) Distribution of misorientation angles between neighboring grains derived from the EBSD data of the highly textured Ge0.913Sn0.087 thin film in Fig. 3(c). The sample is crystallized from the a-GeSn thin film with 9.5 at.% Sn. The inset shows the inverse pole figure obtained over a 0.2 × 0.2 mm2 area, confirming the strong (111) texture. (b) Distribution of misorientation angles between neighboring grains for the 14.5 at.% Sn sample after crystallization annealing and etching away the Sn segregates. The inset shows the inverse pole figure obtained from the same EBSD mapping. Fig. 5 (a) Large-area SEM image of the highly textured Ge0.913Sn0.087 thin film previously shown in Figs. 3(b) and 3(c). The sample is crystallized from a-GeSn with 9.5 at.% Sn. The arrows point to 6 nucleation centers in an total area of ~1.6 mm2, from which GeSn grains grow radially. (b) A zoomed-in image of domain 2 in (a). (c) Large-area SEM image of the 14.5 at.% Sn sample after crystallization annealing and etching away Sn segregates. The radiating dendritic feature is still present, but the density of nucleation centers is increased compared to the 9.5 at. % Sn sample shown in (a) and (b). (d) Large-area SEM image of the 16.5 at.% Sn sample after crystallization annealing and etching away Sn segregates. The radiating dendritic feature is no longer present. Fig. 6 (a) Transmittance spectrum of the high crystallinity Ge0.913Sn0.087 thin film sample compared to a reference sample without the GeSn thin film. (b) Absorption spectrum of Ge0.913Sn0.087 derived from the transmittance spectrum in (a).